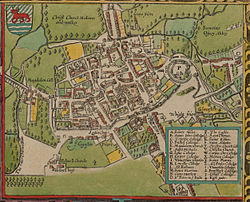 綽號："The City of Dreaming Spires"
A map of Oxford, 1605. 除了BBC在全英國廣播之外，牛津還有多個地區電台廣播，包括了BBC Radio Oxford、Fox FM、Oxford's FM107.9、以及新電台JACK fm、牛津學生電台 (which went on terrestrial radio at 87.7 MHz FM in late May 2005).牛津還有一家當地電視頻道名為Six TV:。The city is home to a BBC TV newsroom which produces an opt-out from the main South Today programme broadcast from Southampton. 牛津主要的當地報章包括牛津時報 (broadsheet; weekly)及其姊妹報章牛津郵報 (tabloid; daily) 及牛津星報 (tabloid; free and delivered)及Oxford Journal (tabloid; weekly free pick-up). Oxford is also home to several advertising agencies. 牛津位於51°45′07″N 1°15′28″W﻿ / ﻿51.75194°N 1.25778°W﻿ / 51.75194; -1.25778 (at Carfax Tower, which is usually considered the centre). ^ Upton, Clive; 等 (编). The Oxford Dictionary of Pronunciation for Current English. 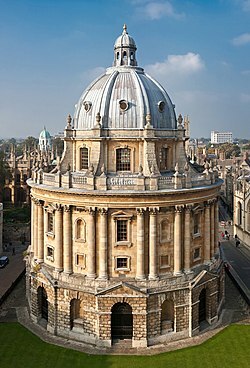 Oxford, England: Oxford University Press. 2001: 734. ISBN 978-0-19-863156-9.